Well Happy Earth Day, polished peeps! No nails today, just an amazing offer from Zoya Nail Polish! I first heard of this promo last year when I was just starting blogging, and since I didn't have a large stash, I sadly had no polishes to exchange. If you have some old polishes which are not 5 free, then this is a great opportunity to get some amazing Zoyas! I suggest Lianne, Avery, and the whole Stunning Collection. Ooo Aurora and Storm are pretty dang amazing also. Sadly, the Pixie Dust polishes are not available on this promo, but with all the amazing Zoya colors, how can you pass up on this deal? Read the details below to learn how to exchange your polishes! 3. Your order value will be adjusted to reflect a 50% discount (we use these funds to properly dispose of the old nail polish). 1. Ship back the equivalent number of bottles you received to the return address below (ie. If you ordered 6 bottles of Zoya – you would send us 6 NON-ZOYA polishes). Please check with your carrier on the proper way to ship nail polish. 2. Include a copy of your order. *Offer valid online at www.zoya.com only. Offer expires on 4/26/2012 at 11:59PM EST. Continental US ONLY. Not valid with any other codes, coupons or promotions. Shipping and handling fees apply. Consumer accounts must exchange a minimum of 6 polishes with a 24 bottle maximum. Salon accounts must exchange at least 12 with a maximum of 48 bottles. Polish can be from any brand EXCEPT Zoya, Qtica or Nocti and can be exchanged for in-stock .5oz Zoya Nail Polish. Excludes all Zoya PixieDust™ Collection shades. Offer is not contingent on customer returning polish. 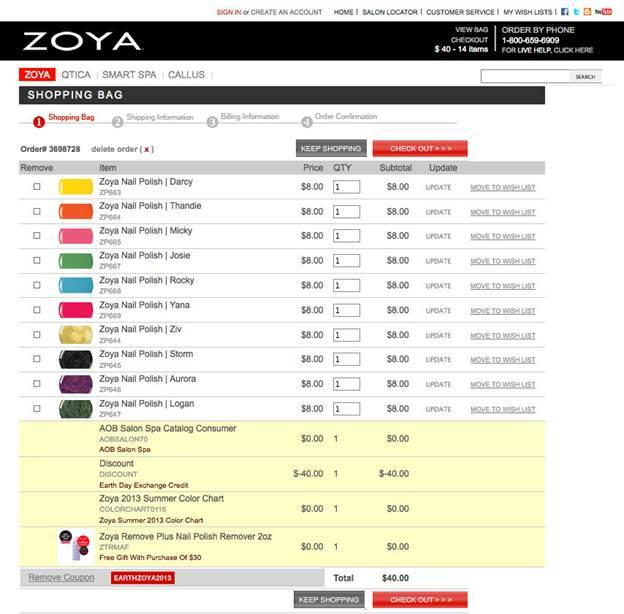 Zoya Exchange code is unique and non-transferable. One code per account. Art of Beauty is not responsible for incorrect addresses, credit card entry errors or errors associated with declined credit cards. Please allow standard time for processing and shipping, however if volume is higher than expected please allow up to 6 weeks for shipping and processing. Art of Beauty, Inc. reserves the right to remove any polish that is out of stock from your order. You will not be charged for this polish. Backordered polish is not included in this promotion. Ok I read the entire post and still don't get it. So if i had 5 empty polish bottles that are not Zoya, Qtica or Nocti I can exchange them for a minimum of 6 polishes with a 24 bottle maximum. Would the new zoya polishes I get be free or just a reduced price? P.S. I have been reading for a while now and love all your nails but I wanted to say that I really like the lightning bolt nail art from July , the rainbow converse and the neon gradient from yesterday.Thanks for letting my nails look awesome with your designs instead of plain. The new Zoya polishes you would receive would be half off ($4 per bottle). From how I understand it, you have to order a minimum of 6 polishes and send back at least 6 polishes. If you want to get 10 polishes, then you can send the minimum of 6 non-zoya polishes. "You do not have to send us the exact amount of bottles that you are ordering" Then there was another area where it says minimum of 6. It's kind of a confusing read (as i just had to re-read it like 10 times lol), that's why i copied and pasted it exactly how they sent it to me so I didn't give the wrong info. But I think you'd be good if you ordered 18 polishes and sent back just 6. Double check with them though, their customer service is amazing!!!!! You don have to send them ANY polish. This promo is a great way to get rid of old nasty polishes, but for all intents and purposes it is simply 50% off 6 or more nail polishes. :) Love it!